Update your tired old baubles and ornaments with rub-on sentiments and glitter glue! 1.Faux vintage style ornaments are everywhere and look far more interesting than plain old shiny baubles. But you easily get this effect by rubbing at the surface of a new bauble with a some nail polish remover soaked cotton wool. A word of warning- work in a well ventilated area and go carefully. Different types of bauble use different paints on the the surface; some will come off almost instantly, others (like mine) will take a while and a bit of elbow grease! The aim to get a vintage, slightly distressed look, rather than to remove the coating entirely. 2.Cut out your chosen sentiment from the sheet and carefully remove the backing sheet. 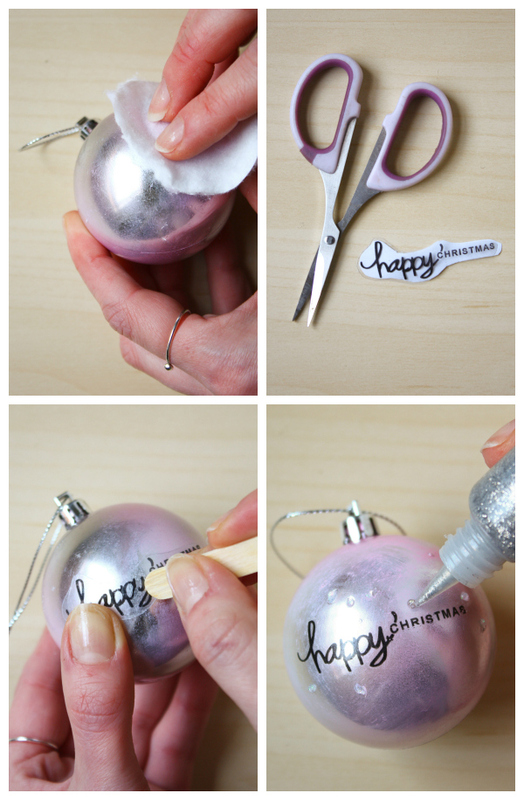 Hold in place on your bauble and begin to rub over the writing using a wooden stick. These are often included with the rub-on sheet, but if now, a lolly stick or a rounded pen lid will work. Once you are happy the lettering has all transferred, slowly remove the clear sheet. 3.Add glitter glue dots, swirls or stars to your hearts content! 4.Allow to dry and they are ready to hang! If you have a go at this Christmas DIY, let me know by commenting below, or message me on on Twitter, Instagram or Facebook! Happy Christmas Making!